Laser technology will keep us coming back to the silver screen, despite our increasingly sophisticated home entertainment systems. That's according to IMAX CTO Brian Bonnick, who certainly cannot be accused of failing to recognise that this is perhaps the most critical time for the cinema industry. With our household tech more sophisticated and better quality than ever, Bonnick told TechRadar that IMAX is well placed to provide us with the wow moments that will keep us glued to the silver screen. 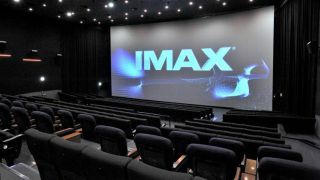 A big factor in that is laser projection, and IMAX's testing of this promising new technology is already at an advanced stage with trials expected this year, beta tests in 2014 and widespread roll out from 2015. Bonnick is palpably excited about this, and he says that this kind of innovation is vital to keep our interest. "I think it bodes extremely well for us that people's desire to have an 'out of home experience' is not going away, he told TechRadar in an extensive interview. "But they will be more discerning because televisions in our homes are getting better, they're getting bigger and better and the average home sound-system is getting more sophisticated so the whole experience is getting better. "I think over time this is going to create a threat to what I would call the coach seats on an airplane. So if I go out I want something significantly better and I think this is going to work in our favour. "People are going to say I want to go out and and I'm willing to pay more because I'm not going out as often, but I want something that is significantly better. "I think it bodes well for us, and it's why it's so critical to continually take out technology further." One of laser projection's potential big wins is its superior contrast ratio - at its most basic, how bright the whites and how dark the blacks look. Bonnick calls contrast "one of the most important things" to how good our experience as viewers is, and tells us just how stark the difference is that laser projection brings. "In digital a current 4K projector has contract of between 1500:1 to 1700:1, a 2K projector is up at around 2100:1 and our existing digital Imax is at 2600-2800:1 it's 30 per cent higher but not where we need to go. "It's a big problem with digital projectors. IMAX film projectors offer up between 3500:1 and up to 5000:1 on a good day and if the print was done well, so that's the benchmark. "With IMAX Digital Laser we are looking at contrast ratios of 8000:1 and higher." Another benefit is a wider palette; Bonnick suggests that a scene like the luminous forest in James Cameron's Avatar would be transformed by the vivid offering that laser projection can bring. This is truly cutting edge technology, and IMAX is having to strip and rebuild cameras from the ground up to get to where it wants to be - a difficult and frustrating task. "This is the largest research and design financial undertaking this company has ever done and it's about more than just one development," Bonnick said. "It's very exciting but very stressful when you are dealing with something that new - there are setbacks every day and I don't sleep a lot at night! "But the benefits that go with laser projection make it worthwhile. We have the best in the world working on this technology. Everything in the system is being done from ground up to take advantage of laser technology. What everyone else is doing is looking to improve the brightness, so they are looking, in a lay sense, to haul the lamps out of their projector and put in a laser.